The Serbian monarchy dates back to the Early Middle Ages. The Serbian royal titles used include Prince, Grand Prince, King, Emperor and Despot. The Vlastimirović dynasty was the first royal dynasty of the Serb people. 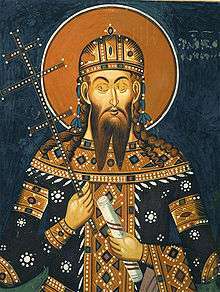 Emperor Constantine VII Porphyrogenitus (r. 913–959) mentions that the Serbian throne is inherited by the son, i.e. the first-born, though in his enumeration of Serbian monarchs, on one occasion there was a triumvirate. The Serbs established several polities by the 10th century: Serbia or Zagorje (hinterlands) which consisted of Serbia (known as "Rascia" in historiography of the High Middle Ages), and Bosnia; and Pomorje (maritime) which consisted of Dioclea, Zachlumia, Pagania, Travunia (including Kanalitai). The Serbian ruler was titled archon, "prince". The history of the dynasty starts with the eponymous founder Vlastimir. This era is marked by the Christianization of Serbs, the many internal and external wars (Bulgars, Magyars), and the power struggle between Bulgaria and the Byzantine Empire in which Serbia found itself in the middle. The history of this dynasty ends with the annexation of Serbia in 969. Unknown Archon fl. 610–641 One of the two sons of an unnamed "king" of White Serbia, he led "half of his folk" to the Balkans and was given land by Emperor Heraclius (r. 610–641), upon receiving his protection (most likely before 626). He is said to have died long before the Bulgar invasion (681). Two or three generations pass without any information. Višeslav c. 780 A descendant of the Unknown Archon, he lived during the rule of Frankish King Charlemagne, and ruled the hereditary lands, župe ("counties, districts"), of Neretva, Tara, Piva, and Lim. He united some Slavic tribes, forming the first Serbian principality. The Macedonian Sclavinia to the south was subjugated by Emperor Constantine VI. Radoslav <830 Son of Višeslav, he or his son Prosigoj are believed to have ruled during the time in which the Royal Frankish Annals speak of Ljudevit Posavski revolting against the Franks (ca. 819–822), during which time "the Serbs controlled the greater part of Dalmatia". At this time, there was peace with the Bulgars. Vlastimir c. 830–850 Son of Prosigoj. He is the eponymous founder of the Vlastimirović dynasty. He defeated the Bulgars in a three-year war against Khan Presian. Vlastimir had three sons (Mutimir, Strojimir and Gojnik) and one daughter. His daughter married Krajina, who received the fief of Travunia. 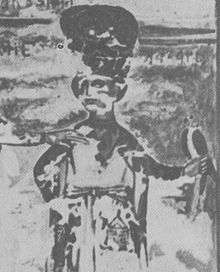 Mutimir 850–891 Eldest son of Vlastimir. Mutimir was the supreme ruler, with his two younger brothers (Gojnik and Strojimir) being subordinate to him. They successfully fought off an attack by Bulgarian Prince Vladimir-Rasate sent by Vladimir's father Boris-Mihail (r. 852–889) in the 850s. Gojnik and Strojimir later revolted against Mutimir, who exiled them to Boris in 855–856, securing brief peace between the two nations. 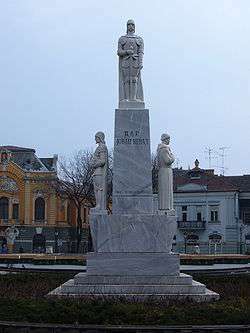 Emperor Basil sent missionaries to Serbia by 869. The Eparchy of Ras was established by 871, as the bishopric of Serbs. Pribislav 891–892 He was the eldest son of Mutimir. 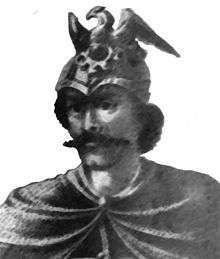 Pribislav ruled briefly until 892 when Petar Gojniković, his cousin, returned and defeated him in battle. Pribislav fled with his two brothers (Bran and Stefan) and son, Zaharije, to Croatia. Petar 892–917 Son of Gojnik, born in ca. 870. His name (Peter) symbolizes Christianization of the Serbs. He returned from exile and deposed Pribislav in 892. He later caught Bran in 895 under an attempted coup and blinded him, and then in 897 he killed Klonimir, the son of Strojimir, in yet another attempted coup. Petar re-gained Bosnia and most of Zahumlje, and annexed Pagania. He defeated Mihailo Višević, the ruler of Zahumlje (917–925), who would warn Simeon of a possible alliance between Serbia and the Byzantines. Petar defeated Pavle, the son of Bran, who was sent by Simeon. 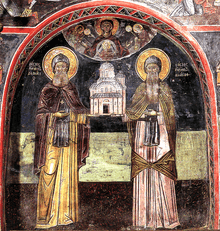 In 917, Simeon's generals tricked and captured Peter, sending him to prison in Bulgaria, where he died within a year. Pavle 917–921 Son of Bran, born in ca. 870–874. He was sent with an army to Serbia in 917, but was defeated by Petar. After Petar was deposed, Pavle took the throne. He defeats Zaharija, the son of Pribislav, sent by the Byzantines in 920. He was initially vassal to Symeon, later he switched to the Byzantine Empire. Zaharija, now sent by the Bulgars, defeats him in 921. Zaharija 921–924 Son of Pribislav. Zaharije was sent in 920 by the Byzantines to retake the throne, but was captured by Pavle and handed over to Simeon who held him hostage for future tactics. In the meantime, Pavle switched sides to the Byzantines; Simeon dispatched Zaharija who managed to defeat Pavle and then betrayed Simeon by supporting the Byzantines. Zaharija defeated the Bulgar army in 923, when he sent two heads and weapons of Bulgar generals as trophies to Constantinople. In 924, a much larger army was sent by the Bulgarians, led by Časlav Klonimirović, Zaharija's second cousin. Časlav won the battle and Zaharija fled to Croatia. Simeon gathered all Serbian counts, and instead of instating Časlav, he arrested them and sent them as captives to Bulgaria, annexing Serbia. Časlav 927–960 Born to Klonimir. Defeated Zaharija in 924, after which he was betrayed by Simeon who annexed the Serbian tribes. He returned and liberated and united the tribes from the Bulgars. His state included the provinces (or tribes) of Serbia (Rascia and Bosnia), Travunia (including the Kanalitans), Zachumlia, Pagania and Doclea; it encompassed the shores of the Adriatic sea to the Morava valley, and the Sava river to the Skadar lake. According to the Doclean Chronicle, he defeated the Magyars, but was later captured and drowned by them. His son-in-law Tihomir, who had held the Drina county, succeeded him as ruler of "Rascia". The state is believed to have disintegrated, and becoming annexed by the Byzantines and Bulgars. Serbia was annexed by the Byzantines (Catepanate of Ras fl. 969–976; Theme of Sirmium 1018–1071), and ruled by strategoi); then by the Bulgars (998–1018). The Serbian principality was succeeded by the principality of Duklja. With the annexation of Rascia, the previous crownland and seat of Serbia, the county around the city of Doclea emerges into a Principality, where the leaders adopt the title archon of Serbs (signifying supreme leadership among Serbs) alongside their given offices under Byzantine overlordship. The first office-holder was Peter of Diokleia, of which we only have a seal found in the 19th century. The next known is Jovan Vladimir, who became a Bulgarian vassal. Stefan Vojislav succeeds in giving the realm independence, he is the eponymous founder of the Vojislavljevići that ruled Duklja from the early 11th century up to the 1120s. The dynasty may have been a cadet branch of the preceding Vlastimirovićs. Jovan Vladimir 992–1016 Jovan fought to protect Duklja from Bulgarian expansion, making an alliance with Byzantium; Bulgaria however conquered Doclea in 997 and took Jovan Vladimir prisoner. Jovan ruled Duklja as a vassal of the Bulgarian empire until his murder in 1016. Stefan Vojislav 1018–1043 Overthrew the Byzantine supremacy over Serbs in Duklja; founder of the Vojislavljević dynasty; in 1035 rebelled against the Byzantine Empire, but forced to sign an armistice; went to war again in 1040, which would be continued by his heir and son, Mihailo. Except Doclea, his realm included Travunia with Konavli and Zachumlia. Mihailo I 1050–1081 Grand Prince 1050–1077, King 1077–1081. note: Rascia is liberated from Byzantine rule and restored into the Serbian realm of Doclea, with Duklja being the seat. Constantine Bodin 1081–1101 Son of Michael. 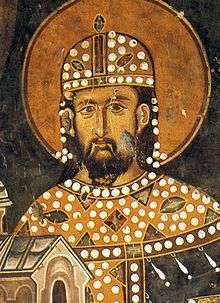 He was crowned 'Tsar of Bulgaria' as Peter III in 1072, after the being chosen by Bulgarian nobles through his Cometopuli lineage, he was sent off with an army that would conquer parts of southern Serbia and Macedonia. He was captured and sent to Constantinople, where he spent several years. He was rescued in 1078 by Venetian sailors, and in 1081 he succeeds his father as King. He enlarged his realm, installing his nephews and other family in Bosnia and Rascia. He is captured by the Byzantines in the 1090s, and continues as a mere Byzantine vassal, with his peripheral provinces gaining independence, of which Rascia becomes the most powerful one. note: Rascia breaks out of the state, subsequently becoming the most powerful of the Serbian principalities (1091). Doclea is continued with a number of Byzantine and Serbian vassals (until 1146) - see List of rulers of Duklja. 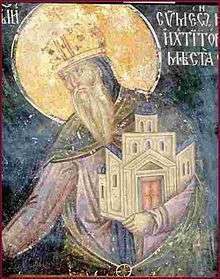 In the mid-11th century, Mihailo I had liberated Rascia from Byzantine rule, and appointed his son Petrislav to rule as Prince, independently. In 1083, Constantine Bodin appoints brothers Vukan and Marko, sons of Petrislav, as rulers of Rascia. In 1089, the Byzantines capture Bodin, and Vukan retains independence, founding the Vukanović dynasty. The Vukanovići quickly claim the following Serbian domains in the following decades, and by 1148, the maritime possessions are united with the inland. The Byzantine Empire at times intervened in the political scene, and at times Serbia had Hungary as its main ally. The dynasty ruled until 1165, when a dynastic branch is instated by the Byzantines. Vukan 1083–1112 Vukan was the son of Petrislav, the Prince of Rascia and son of Mihailo I, that held the office from ca 1060. In 1083, Constantine Bodin appoints Vukan to the supreme rule of "Rascia", while Vukan's brother Marko administrated a part of the land, most likely the frontier region in the north. After the Byzantine campaign against Duklja in 1089, and the subsequent civil war, Vukan asserted independence, ruling as Grand Prince, becoming the most powerful Serb ruler as of ca 1091. He began raiding Byzantine territories in 1090, taking Kosovo, and defeated a Byzantine army in 1092. Vukan made peace with Alexios I Komnenos, after the Emperor had threatened with a larger army. However, Vukan immediately broke the treaty as the Byzantines marched onto the dangerous Cumans in Adrianople. Vukan conquers the cities along the Vardar. In 1095, the Emperor meets Vukan and renews the treaty. Vukan again raided Macedonia, as the First Crusade began. In 1106 he nominally recognized Alexios I. Note: Rascia is elevated to an independent Grand Principality. Uroš I 1112–1145 Uroš I was the son of either Vukan or Marko. In the treaty concluded between Vukan and Alexios I in 1095, Uroš I and Stefan Vukan became "guarantors of peace", as hostages to the Byzantines. Uroš succeeds the throne when Vukan dies. In ca 1130, he married his daughter, Jelena, to King Béla II of Hungary. Béla II, being blind, relied entirely on Jelena who acted as a co-ruler. In 1137, Ladislaus II, the son of Béla II and Jelena (the grandson of Uroš), becomes the Ban of Bosnia. Uroš II 1145–1162 Replaced his father at 1131 or around 1140 and ruled until 1155.
note: Duklja and Travunia is re-incorporated into the realm. Beloš 1162 Instated by Manuel I Komnenos. Desa 1162–1166 Desa took Zeta (Duklja) and Travunia from Radoslav of Duklja and unified the coastal Serbian Principalities under his firm grip. Tihomir 1166 First son of Zavida, exiled Župan of Zahumlje. After Desa's revolt, in 1165 the Byzantium divided the Serb lands between the four sons of Zavida: Tihomir in Raška, Stracimir in Duklja, Miroslav in Zahumlje and Travunia, and Stefan Nemanja in Toplica (in today's central Serbia). 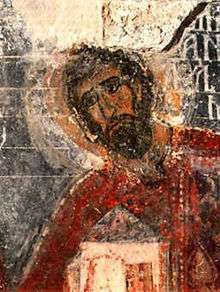 Stefan Nemanja rebelled against his eldest brother Tihomir in 1166, who fled with his brothers Stracimir and Miroslav to Byzantium to seek help. But later on, Stefan Nemanja defeated his Greek army of mercenaries in the same year near the town of Pantino on Kosovo in which poor Tihomir drowned in the River of Sitnica. Nemanja captured his other brothers and made peace with them by giving them rule in their former parts of the land to recognise him as the only ruler of Rashka or Serbia. The Nemanjić dynasty was named after Stefan Nemanja and ruled over Serbia until 1371. The Nemanjić dynasty ruled the Serb lands between ca. 1166 up to 1371. 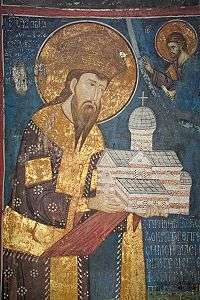 Stefan Nemanja 1166–1196 Nemanja is the eponymous founder of the Nemanjić dynasty. He re-established control over the neighbouring territories, including Duklja, Hum and Travunia. In his last years, he joined his son Sava and took monastic vows, later recognized as Saint Symeon after numerous alleged miracles following his death. Note: Duklja, Zahumlje and Travunija is reconquered, Nemanja is proclaimed "Grand Prince of All Serbia"
Vukan 1202–1204 Eldest son of Stefan Nemanja. He held the appanage of "Duklja, Dalmatia (Zahumlje), Travunija, Toplica and Hvosno" as Grand Prince, by 1190. He was the initial heir presumptive, but his father chose Stefan instead upon the abdication in 1166. With the death of Nemanja, Vukan started plotting against his brother. He found help in Hungary, and together they forced Stefan to flee to Bulgaria. He ruled as a Hungarian vassal, evident in Emeric I's title "King of Serbia". He left the throne in 1204, and continued to rule his appanage, he was later pardoned by the third brother Saint Sava. 1204–1228 Second son of Stefan Nemanja. He inherited the title of Grand Prince in 1196 when his father retired as a monk. His reign began with a struggle against his brother Vukan, who expelled Stefan to Bulgaria. Kaloyan gave him an army of Cumans in exchange for eastern territories. The crisis ended when Sava negotiated a peace between the brothers and Stefan's power was cemented. 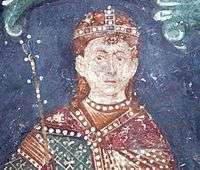 He was crowned King in 1217, and then Sava gains autocephaly, becoming the first Archbishop of Serbs in 1219, thus Serbia retained full independence. Stefan Radoslav 1228–1233 Son of Stefan the First-crowned. He ruled Zahumlje during the reign of his father, and also held a governor status of Zeta. He was the co-founder of the Žiča monastery with his father, who would abdicate in 1227 due to illness, taking monastic vows. Radoslav was crowned by his uncle Sava, the Archbishop of Serbia. His marriage to Anna Doukaina Angelina would prove unpopular as she undermined his authority, he lost the loyalty of the people and in 1233 a revolt against them prompted the couple to flee to Dubrovnik. 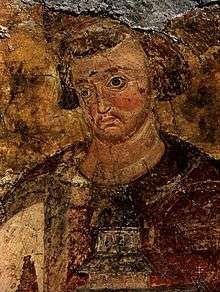 Stefan Vladislav 1233–1243 Son of Stefan the First-crowned. He succeeded his brother Radoslav in 1233 and ruled for 10 years, before being overthrown by his younger brother Uroš. He continued to rule Zeta. 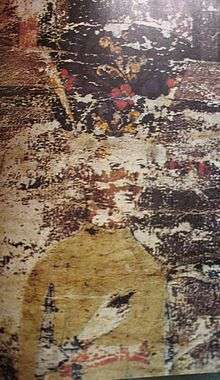 The first known flag design of Serbia was found in his treasury. 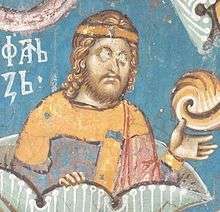 Stefan Uroš I 1243–1276 Son of Stefan the First-crowned. He succeeded his brother Vladislav. He boosted trade with Dubrovnik and Kotor, marking a beginning of economic prosperity. In 1253 a war was fought against Dubrovnik, peace was signed in 1254, and in the 1260s a second war begun that ended in 1268. Uroš immediately turned towards Hungary, successfully taking Mačva, he was however captured and peace was ensured between the two Kings through marriage of Dragutin and Catherine, the daughter of Stephen V of Hungary. His oldest son Dragutin would have succeeded his rule, but Uroš favored Stefan Milutin, the younger son, as successor. He was overthrown by Stefan Dragutin in 1276. 1282–1316 Son of Stefan Uroš I. He overthrew his father with help from the Hungarian royalty (through his marriage to Catherine of Hungary) after the Battle of Gacko. He was injured in 1282, and gave the supreme rule to his younger brother Milutin, but continued to rule what would later become the Kingdom of Srem with the capital at Belgrade. Milutin boosted relations with the Byzantine Emperor, and refused to give the rule to Vladislav II (Dragutin's son), causing a split of the Kingdom. Dragutin continued to rule the northern frontier in Hungarian alliance, but in the last years re-connected with Serbia, acting as a vassal. Stefan Milutin 1282–1321 Son of Stefan Uroš I. He succeeded his brother Dragutin. Upon his accession, he immediately turned towards Macedonia, conquering the northern part with Skoplje, which became his capital. He continued deep into Byzantine lands, taking northern Albania and as far as Kavala. He also took Bulgarian Vidin, and later Durres. He was in a succession war with Dragutin after peace was signed with the Byzantines in 1299. Milutin aids the Byzantines against the Ottoman Turks at the Battle of Gallipoli, which ended in a victory. When Dragutin died he put most of his lands with Belgrade under his rule, in the same year his son Stefan Uroš III tried to overthrow him, resulting in him being exiled to Constantinople. In 1319 the Hungarians took all of Dragutin's lands but Braničevo. Stefan Vladislav II 1316–1325 son of Dragutin. Stefan Konstantin 1321–1322 Younger son of Stefan Uroš II, defeated in 1322 by his older brother, Stefan Uroš III. the Mighty 1331–1355 Son of Uroš III. He was a very skilled military leader, and defeated Bosnia and Bulgaria at the age of 20. As his father was not an able conqueror, Dušan removed him from the throne. Dušan doubled the size of the realm, taking Byzantine lands as far as the Peloponnese. He was crowned Emperor in 1346. The Serbian Empire flourished, becoming one of the most developed countries and cultures in Europe. He enacted the constitution - Dušan's Code in 1349.
the Weak 1355–1371 Son of Stefan Uroš IV Dušan, crowned King of Rascia (1346–1355), succeeds as Emperor after the death of Dušan in 1355. His epithet was given due to his "weak rule". Simeon Uroš Uncle of Uroš V. He was appointed governor in the southwestern conquered regions in 1348, and ruled until 1355, when his brother-in-law Nikephoros II Orsini returned and rallied support. 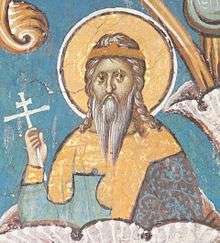 Nikephoros was killed in 1359, and Simeon continued his rule until his death in 1371. He proclaimed himself "Emperor of Serbs and Greeks" in 1356, however against the wishes of nobility of Serbia proper and Macedonia. After an unsuccessful invasion of Zeta, he gave up the idea of ruling Serbia. Jovan Uroš Son of Simeon Uroš. Succeeded his father as titular "Emperor of Serbs and Greeks" and ruled an area of Epirus and Thessaly 1370–1373 before taking monastic vows. 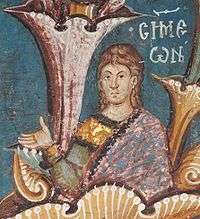 In 1384–1385 he helped his sister Empress Maria Angelina Doukaina Palaiologina govern Epirus (she was the widow of Thomas II Preljubović, the Despot of Epirus 1367–1384). The crumbling Serbian Empire under Stefan Uroš V (called "the Weak") was to be of little resistance to the powerful Ottoman Empire. In light of conflicts and decentralization of the realm, the Ottomans defeated the Serbs at the Battle of Maritsa in 1371, making vassals of the southern governors, soon thereafter, the Emperor died. As Uroš was childless and the nobility could not agree on the rightful heir, the Empire was ruled by semi-independent provincial lords, who often were in feuds with each other. 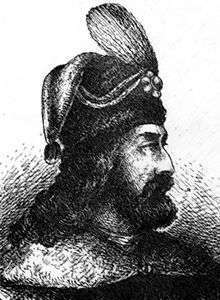 The most powerful of these, Tsar Lazar, a Duke of present-day central Serbia (which had not yet come under the Ottoman yoke), stood against the Ottomans at the Battle of Kosovo in 1389. The result was indecisive, but it resulted in the subsequent fall of Serbia. Moravian Serbia: Lazar, a nobleman and close friend of the Nemanjić, would govern modern Central Serbia. 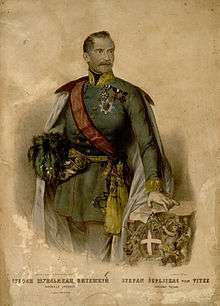 He married Milica, a descendant of Stefan Nemanja's eldest son Vukan. 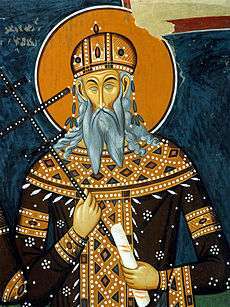 He held the title of Lord during the Empire, and Prince after the death of Uroš V. He had a son, Stefan, who would succeed as Prince, and in 1402 he was given the title despotēs (hence "Serbian Despotate"). District of Branković: Vuk Branković, the son of Ohrid deputy Branko, would govern Sjenica, Kosovo and Skopje under the suzerainty of Lazar. He had a son, Đurađ Branković, who would succeed Despot Stefan. Their province continues as part of the Serbian Despotate. Lordship of Prilep: King Vukašin, a nobleman and close friend of Uroš V, would govern most of the Macedonia region. He held the title of Lord during Dušan, and under Uroš V, he was crowned King as [subordinate] co-ruler in 1365. Vukašin ruled as "Lord of the Serbian and Greek lands, and of the western provinces." He was succeeded by Prince Marko, who became an Ottoman vassal. Their province is annexed by 1395. Lordship of Kumanovo/Velbazhd: Constantine Dragaš, a nobleman and brother-in-law of Dušan, would govern Preševo to Kyustendil. 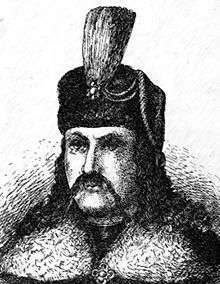 Jovan Dragaš succeeds him as Despot in 1365, and becomes an Ottoman vassal in 1371. Their province is annexed by 1395. Lazar Hrebeljanović 1371–1389 None After Uroš V died, the last of the Nemanjić emperors, through a combination of diplomacy, military action, and family alliances, Lazar emerged from the resulting power vacuum as the most powerful Serbian noble not in the Ottomans' service. 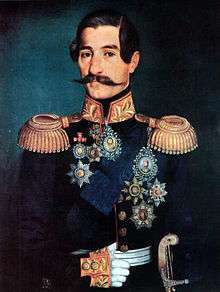 He acquired dynastic legitimacy by marrying Milica Nemanjić, and despite retaining only the minor title of knez ("prince"), he nevertheless used the imperial name of 'Stefan' as well as the designation "autocrator". 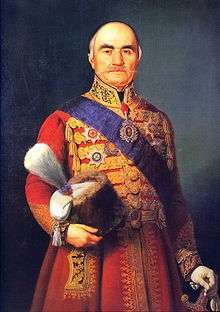 Lazar spent his time strengthening the Serbian state, knowing fully well that he would eventually have to face the Ottoman threat. He unified most of Serbia under his rule and managed to gain the loyalty of a majority of the Serbs. He also ceded the title "King of Serbs" to King Tvrtko I of Bosnia (great-grandson of Uroš the Great). His first major military action was at the Battle of Dubravnica where his two subjects, Crep and Vladimir managed to decisively defeat an Ottoman army in southern Serbia. No further recorded hostilities took place until the Battle of Pločnik where Knez Lazar managed to crush an Ottoman force and drive them back to Niš. Serbian troops also took part in the Battle of Bileća where again he defeated the Turks. Lazar was killed during the 1389 Battle of Kosovo along with most of Serbia's political elite. Stefan Lazarević 1389–1427 Ottoman 1391–1404----Hungarian 1404–1427 Son of Lazar. In 1391, Serbia became an Ottoman vassal, so Stefan was obliged to aid the Ottoman sultan in battles when asked. He did so in the Battle of Rovine in May 1395 against the Wallachian prince Mircea I and the Battle of Nicopolis in 1396 against the Hungarian king Sigismund. After that, Sultan Bayezid awarded Stefan with the Vuk Branković's land on Kosovo, as Branković sided with the Hungarian king at Nicopolis. When Mongols entered the Ottoman realm, Stefan Lazarević participated in the Battle of Angora in 1402 when Ottomans were defeated and sultan Bayezid was captured. Returning to Serbia, Stefan visited Constantinople where the Byzantine Emperor Manuel II Palaiologos granted him the title of despot. In previous years, title would mean that the despot would rule some vassal state, but as the Byzantine Empire was too weak to assert such a rule and Serbia was not its vassal state, Stefan Lazarević took this title as the personal style of the Serbian monarchs, thus the Principality of Serbia became the Serbian Despotate. Vukašin Mrnjavčević 1365–1371 None Killed in the Battle of Maritsa. Marko 1371–1395 Ottoman Son of Vukašin. Killed in the Battle of Rovine. The Branković family descends from the Nemanjići and the Lazarevići via female line. The family rises to prominence during the time of disintegration of the Serbian Empire under the last Nemanjić. The original family domains were centred around Kosovo region, one of the heartlands of medieval Serbian state. Later members of the house extended their rule over all remaining independent regions of Serbia making them the last suzerain rulers of medieval Serbia. The dynasty ruled the Serbian Despotate from 1427 to 1459. Stefan Branković 1458 – April 8, 1459 Son of Đurađ I, regent for niece. Serbia proper was annexed by the Ottoman Empire in 1459. Stephen Tomašević 1 April 1459 – 20 June 1459 He married Helena Branković, the eldest daughter of Lazar Branković and Helena Palaiologina. Serbia is conquered by the Ottoman Empire. The Serbian nobility enters the service of Hungary. The regnal title of despot is given by the Hungarians (titular despot of Serbia). Vuk Grgurević Branković 1471–1485 Grandson of Đurađ I. In 1471 a dependent Serbian state was established by the Hungarians mostly on the territory of Vojvodina and Syrmia. Radič Božić 1527 Vassal of John Zapolya. Pavle Bakić 1537 Vassal of Ferdinand I.
Radoslav Čelnik 1527–1529/30 Srem He was general commander of Emperor Jovan Nenad's army. November 3, 1768 – July 24, 1817 February 15, 1804 – September 21, 1813 Leader of the First Serbian Uprising. Founder of Revolutionary Serbia Deposed and exiled to Austria. November 6, 1817 – June 25, 1839 Leader of the Second Serbian Uprising. Founder of Principality of Serbia Abdicated. October 21, 1819 – July 8, 1839 June 25, 1839 – July 8, 1839 Principality of Serbia Ruled for only 26 days. July 8, 1839 – September 14, 1842 Principality of Serbia Deposed by the Defenders of the Constitution. October 11, 1806 – May 3, 1885 September 14, 1842 – December 23, 1858 Principality of Serbia Abdicated. December 23, 1858 – September 26, 1860 Principality of Serbia Died due to old age. September 26, 1860 – June 10, 1868 Principality of Serbia Assassinated in Košutnjak. 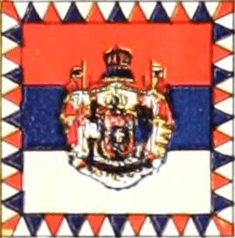 August 22, 1854 – February 11, 1901 June 10, 1868 – March 6, 1882 Principality of Serbia Proclaimed King of Serbia. August 22, 1854 – February 11, 1901 March 6, 1882 – March 6, 1889 Kingdom of Serbia Abdicated. August 14, 1876 – June 11, 1903 March 6, 1889 – June 11, 1903 Kingdom of Serbia Assassinated together with Queen Draga in the May Coup. The end of Obrenović dynasty. June 29, 1844 – August 16, 1921 June 15, 1903 – December 1, 1918 Kingdom of Serbia In exile from November, 1915 due to the Serbian Campaign. For the continuation of this list, go to List of heads of state of Yugoslavia. In 1918, Serbia became part of the newly formed Kingdom of Serbs, Croats and Slovenes. Later that state changed name in the Kingdom of Yugoslavia (i.e. Kingdom of South Slavs). In that period (between World War I and World War II) the country was nominally a parliamentary monarchy, ruled by the Karađorđević dynasty. After World War II and the civil war Yugoslavia became a communist state, Socialist Federal Republic of Yugoslavia, ruled by Josip Broz Tito and the League of Communists of Yugoslavia. After Tito's death in 1980, the federation started a process of dissolution which finished in a series of civil wars in the early 1990s. Through the 1990s, constituent republics Serbia and Montenegro comprised the Federal Republic of Yugoslavia, which was restructured in 2003 into a confederation called Serbia and Montenegro. The state union ended with Montenegro's separation following the 2006 independence referendum. Currently Serbia is a parliamentary republic.